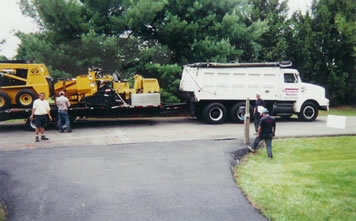 Kerrigan Paving and Tar & Chip is class A state licensed and fully insured. We have been proud of our achievements and levels of success. We know that the only measure of our success is the satisfaction of our customers. Over the years we have done a great job of achieving our primary goal of customer satisfaction. We are committed and determined to providing our customers with quality work while promoting an honest and reliable service. Kerrigan Paving and Tar & Chip has provided high levels of craftsmanship that has far surpassed the industry standard. Our customers are secure and confident choosing Kerrigan Paving and Tar & Chip to protect their valuable investment. It is our pleasure to provide you with a reference list of customers in your area and copies of our insurance and licenses so that you too will be assured that Kerrigan Paving and Tar & Chip is the best possible choice. Why Tar and Chip Paving is better?